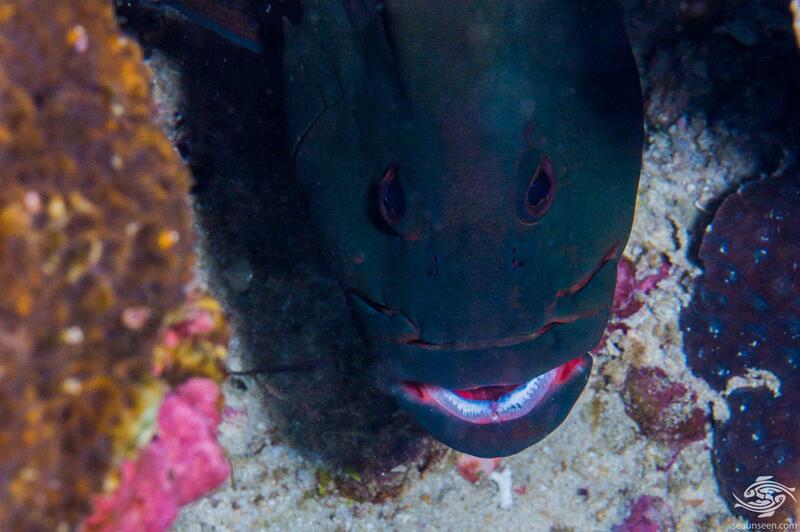 The Redmouth grouper Aethaloperca rogaa) is also known as the Red-flushed Cod and Redmouth Rockcod. 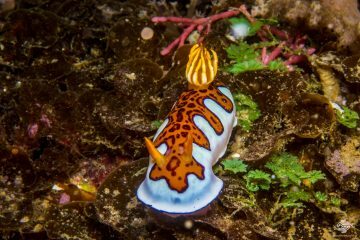 They are fairly common off the coasts of Tanzania. They are not that common in the Dar es Salaam area which is heavily overfished. The Redmouth grouper has a deeper and more laterally compressed body compared to most groupers. In the adult the body colouration under lights is a green colour as can be seen in the images. 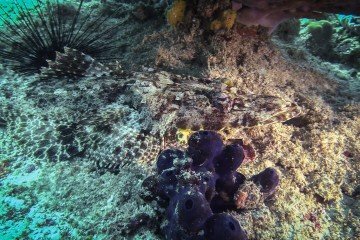 The body appears covered in green diamond shaped scales and when viewed from a slight angle the Redmouth grouper appears a brownish color. This can be seen in the last image in the post. 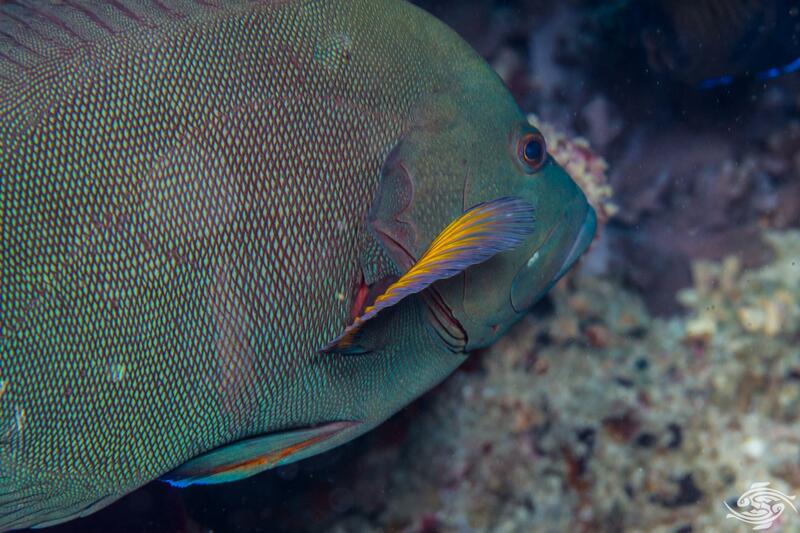 The pectoral fins have a bold yellow mark on them and the caudal fin has a light blue edging. As one would expect, the inside of the mouth is either a pink or a red colour. 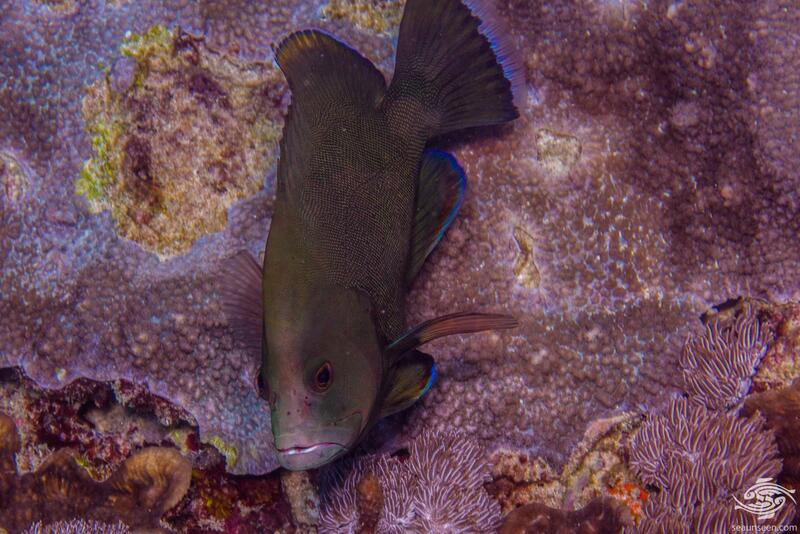 The juveniles which are disctinctly more oval in shape than other groupers and are darker coloured than the adults. They are said to mimic some species of the centropyge angelfish, but the only centropyge angelfish in Tanzanian waters are multispinis and bispinosa. The juveniles resemble neither of these species. Redmouth grouper grow up to 60cm but it is rare to see one this large. Usually they are in the 35 to 50 cm range. 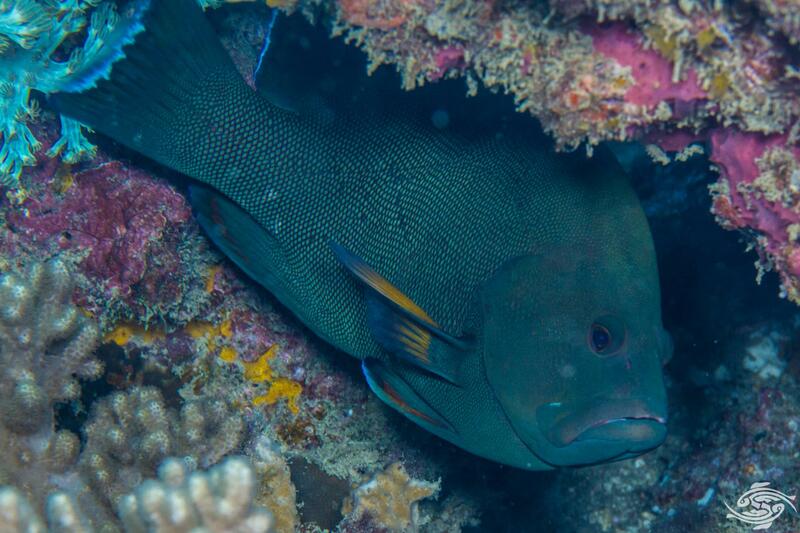 The Redmouth grouper is extremely shy in the Tanzanian coastal waters and tends to head for cover at the first sign of a diver. It is very rare to get close to them, they are remarkably skittish. This is undoubtedly due to the dynamite fishing that used to be prevalent but has hopefully stopped now. On the offshore islands of Mafia and Zanzibar they are not as shy. They are almost always seen singularly and when seen at a distance are often cruising the reef in a slow head down fashion. Redmouth grouper are found on the East African coast from South Africa to Kenya across to Japan and south to Northern Australia. 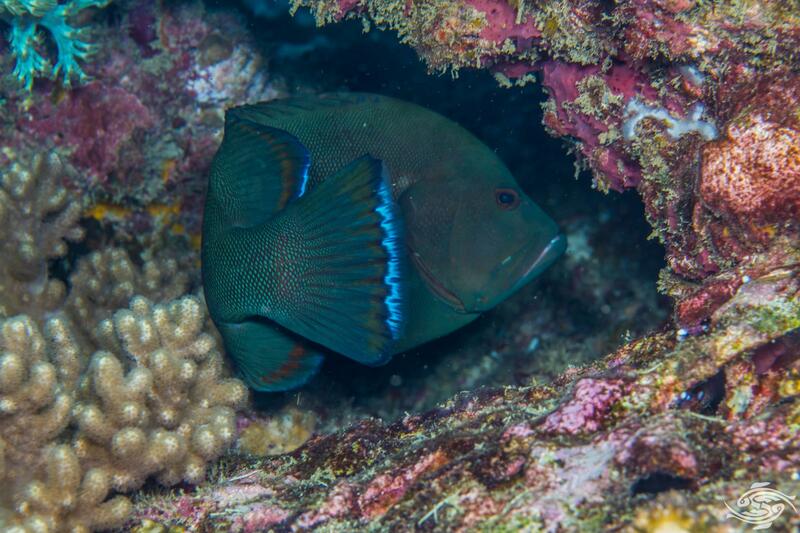 In Tanzanian waters they are seen only on the slightly deeper reefs from about 15 meters onwards, either on the reef tops or on coral walls that drop off into deeper waters. 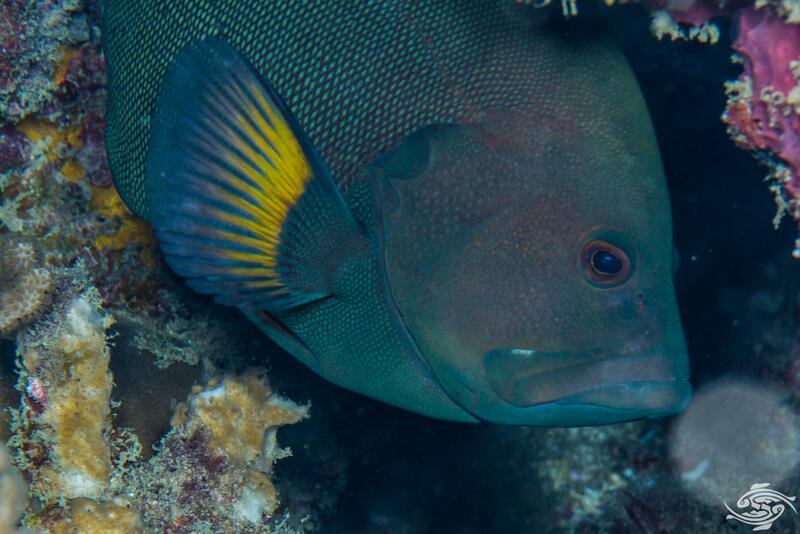 The main diet of the Redmouth grouper is small fishes and crustaceans. They may vary their diet according to location and availability and as with most groupers pretty much anything moving that can fit into their mouths they will have a go at it. The are caught on the line indicating they will scavenge. 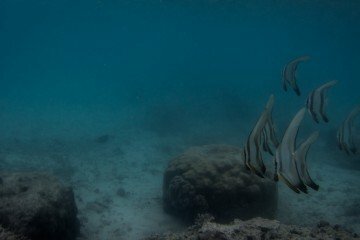 They seem to swim slowly over the top of the reef grabbing prey without making much of a fuss about it. 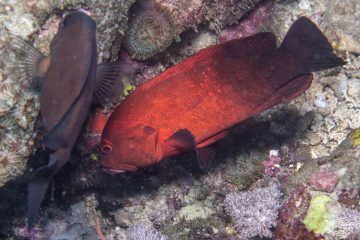 Not that much seems known about Redmouth grouper reproduction. Females are mature at about 35 cm. 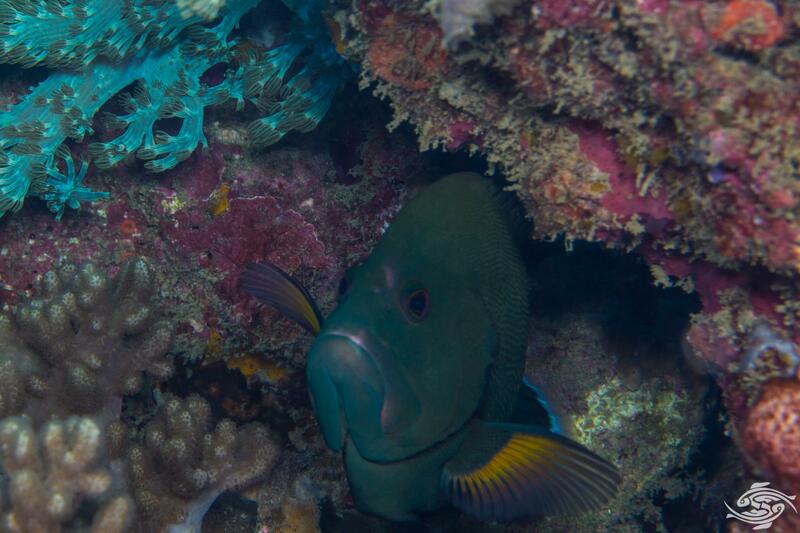 Groupers are usually found in groups of a male and several females. Spawning takes place between couples. The Redmouth grouper is certainly over fished by subsistence fishermen in Tanzania. Most inshore areas of the Tanzanian coast are heavily over fished. 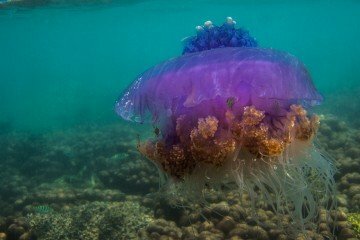 In the Marine Park areas they are more common. Allen, G.R. 1997. 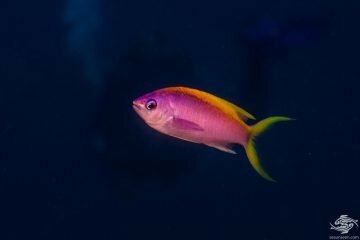 Marine Fishes of Tropical Australia and South-east Asia. Heemstra, P.C. and J.E. Randall, 1993. FAO Species Catalogue. Vol. 16. Groupers of the world (family Serranidae, subfamily Epinephelinae). An annotated and illustrated catalogue of the grouper, rockcod, hind, coral grouper and lyretail species known to date. Rome: FAO. FAO Fish. Synop. 125(16):382 p.